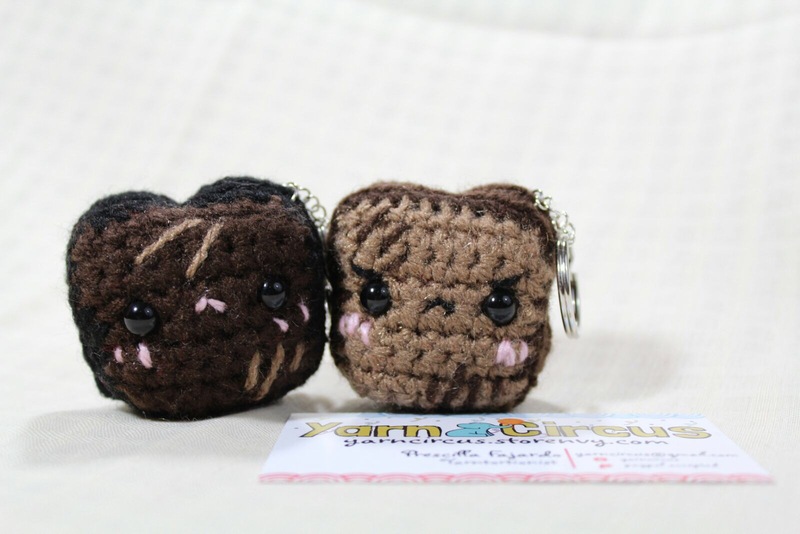 Yarn Circus is creating handmade plushies made out of yarn & other crafty things! We're Yarn Circus, a business located in the heart of California. We create crochet plushies, homegoods, and other goodies based on our silly doodles, as well as on fandoms we enjoy. I began crocheting when I was in my freshman year of highschool alongside my best friend. We sold our finished items to fund raise for clubs and school activities. Over my highschool years, I did quite a few custom pieces for people, it was pretty fun! After high school, Saul & I started this whole thing officially around my first year in college, where I turned to crochet to cope with the emotional struggles I had faced. We sold at our first show at the Lodi Street Fair of May 2016 and since then, we've been working our tails off ever since. I began teaching crochet in 2017, and love spreading this old craft to others. People never think they can make beautiful creations with just a hook and yarn but, with the awe on their faces once they get even just a chain down- is a beautiful moment! I love doing what I do. I recently quit my part time job to pursue Yarn Circus full time. My goal is to continue to make the world a happier place, one stitch at a time. The feeling of seeing others enjoying my work, and having my items find new homes is so priceless- I can't even imagine loving any job more than this one. Even though my online presence is extremely important to continue to keep us relevant in the ever growing crochet world, going to shows and fairs is such a big part of my business. I want to continue to meet our customers in person and let them know that shopping small and supporting local businesses instead of chain stores is SO MUCH BETTER for everyone & the economy! Along with making stuffed animals and other goodies- I love to teach. It is one of my greatest passions to teach crochet and crafts to others and I hope to continue doing that. In 2018 alone, I believe I had taught atleast 20 classes, and I hope to double.. even triple that number in 2019! Through each pledge, you will help continue to support our business! It will go to supplies for new projects, and also help us continue to attend shows and conventions. I want to continue to focus on Yarn Circus full time so I can continue to provide better quality and range of products for you! We hope that through Patreon Support, it will help us continue to pay for our event costs and provide even more wonderful items and content for you to enjoy! We thank each and every one of you for continuing to enjoy our work & sending us good vibes! - Access to Patreon Exclusive content such as posts, photos, and possibly videos! - A shout out at the end of our vlogs/videos for that month! - A 2 x 3 random watercolor doodle that surrounds the theme of that month! ** Please add $3 extra to cover shipping outside of the US. - A 1.25 Pin Back Button that surrounds the theme of the month! - A hand-crocheted phone charm/key chain based on the theme of the month! Pie Like You Berry Much! - A crochet stuffed animal (2-4 inches) based on the theme of the month. This tier is the monthly plush box tier! We love going to fairs and shows to see ya'll in person but, traveling can be expensive. Meeting this goal would mean we can continue to afford to travel to smaller shows and pay whatever supplies we need to bring better product for them!